First of all, this is not part of my project, even though this is Rozen Maiden, so it cannot be used by anyone unless for desktop use. I can alter resolution size for anyone, so don't hesitate to ask. EDIT: I'm such a dimwit! Thanks to Revan's reference to the motif similarly used in another scan, I forgot to add in the roses! I knew those blank circles were meant for something...Also I raised the opacity of the texture so it should be more obvious now. Is it just me, or is that scan has nouveau goodness? Hah, I haven't commented on your stuffs quite awhile. And fullviewing this never regret me either. Background, for me, looks simple. The texture could be better, without the obvious tiled effect. Probably picking a higher resolution/seamingless textures would be cooler. OMG this is so Pretty! Its so neat and clean, such great vector skill as usual, and its so colorful. I love the layout. Great Job on it, Big Fan here! :D Fav from me ;). hm..... okay! that's a nice one really i'm thinking of a noticed! This is total vector awesomeness. Really love the pattern at the back and reminds me of that scan we have somewhere around of the bunny dude Laplace no Ma by zweihaenderlim, there. 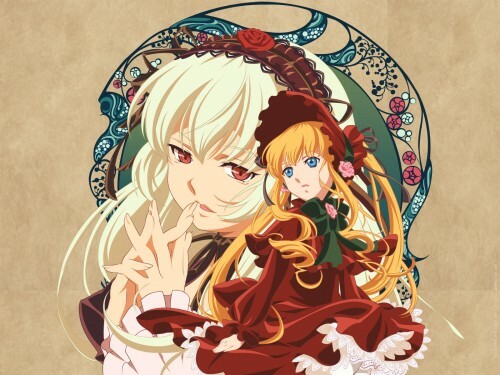 It had been a while since I saw such a nice wall for Rozen Maiden... and... not dark? what's going on with me? Very nice! The vectoring is really awesome (as usual ;)) and the nouveau-ish background works really well! Great job! This is so beatiful! Absolutely beautiful... I'm speechless! I love this series! Your vector is really clean and well done, good job! Though, Shinku's mouth could use some work, it looks sort of strange right now. Thanks for the vector wallpaper! Wow! Amazing vector! I love it! The background is simple but thus, it fullfills the function of putting the vector more into the viewer's sight. that's a very good wallpaper, you did a good job on vectoring the image it looks great.